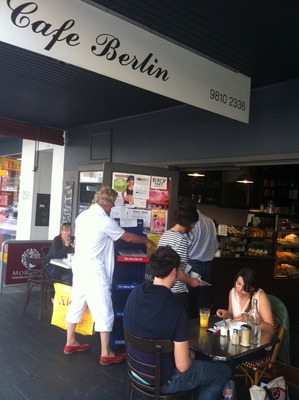 Cafe Berlin is a crowd magnet. Their cake window is so inviting, and it has always been this way. One slice of these cakes is just so filling, to the point where I need someone to share a slice with me. It is an establishment that has stood the test of time in Balmain, and it is great that this establishment has been refurbished to keep up with the trends of the area. Great vibe, although it does get extremely busy at times, so you would be lucky to get a table, especially on the weekend. Otherwise on Thursday, at lunchtime, I have found this establishment to be perfect table wise. If I come here alone, I do not bother about the cakes but rather come for a serve of their yummy and most filling fish and chips with a decent serving of salad. For around $20 a pop, it is a great filling lunch. Great service, although a minor pet hate is that this establishment is still a 'cash only' business. Just need to be prepared that's all. And their lattes are also great too, so if I come alone and I am not in the mood to eat, a coffee is the next best thing. It needs to be visited to be appreciated.